One in four women work as professionals. Their support for Labor candidates steadily increased from 1980 under Coalition Prime Minister Malcolm Fraser and by 2004, this support had levelled off to split 50/50 between Labor and the Coalition. However, the inner-urban professional seats – such as Melbourne Ports and Brisbane – swung to Coalition Leader Malcolm Turnbull in 2016, bucking the national swing back to Labor in 2016. About one in four men work as Tradies and one in four women work in clerical and admin jobs. Since the 1966 election, Tradies have been seen as the pro-union, working class foundation for Labor campaigns, with the politically non-aligned female clerks successfully targeted in 1972 and 1974 to provide the more volatile winning margin in the outer suburbs. 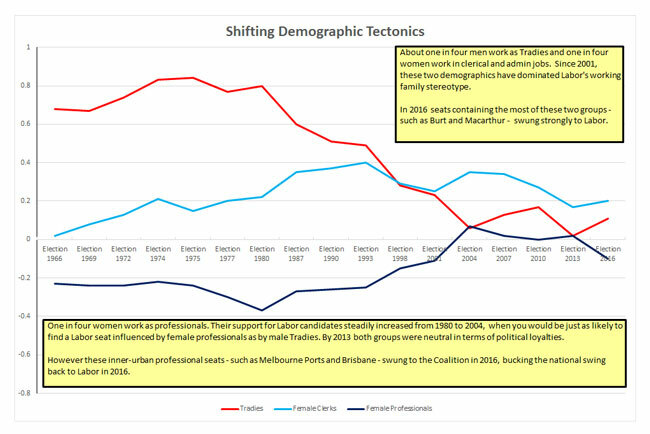 The political significance of these two demographics switched after the period 1977 to 1980, and by 1998-2001, we were more likely to see safe Labor seats dominated by female clerks than by male Tradies, as white-collar workers became more unionised, and many older, blue collar workers such as the Howard Battlers, switched to the Coalition in the outer suburbs. These two groups have remained the ALP’s campaign focus as Labor’s Working Family Stereotype and in 2016 seats containing the highest proportions of Working Families -such as Burt and Macarthur – swung strongly to Labor and Bill Shorten, even as former pro-Labor professionals moved in the reverse direction towards, small-l Liberal Malcolm Turnbull. So, the Coalition lost Working Family seats across Australia’s outer suburbs, but clung to power by its fingernails across wealthier, inner urban professional seats. 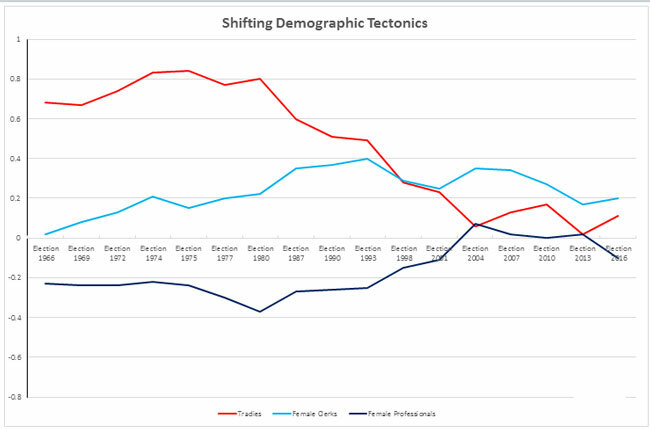 In this ADS update, we’re publishing the last instalment of John Black’s demographic profiles of Australian voting behaviour, stretching back to the 1966 Federal election. This instalment covers the period of 1977 to 1980, the mid-point of Malcolm Fraser’s Prime Ministership, which marked a watershed era for the demographic alignments of Australia’s biggest occupational voting blocs: Tradies, Clerks and Professionals. These three groups determined the outcome of the last election, and they are also likely to determine the outcome of the next election. Read how they came of age here. 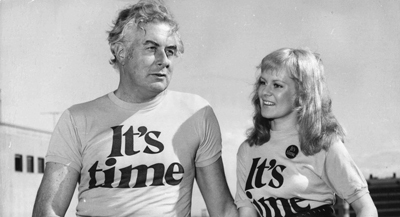 PROJECT 2A, B & C – Any election you win is a good result and 1972 was no different for Gough Whitlam and the It’s Time campaign. In 1972, Whitlam was backed up by a then record spending campaign organised by his new National Campaign Director Mick Young, with all the latest campaign disposables – the tight T shirts, theme tunes and show business hangers on. It was Labor’s first truly national campaign but it still generated a relatively small swing of only 2.5 percent and the dividend in terms of seats won was patchy, with 12 seats won in the eastern states but the western states and Victoria ceding four seats to the Coalition. And we have to factor in here that in 1972 Whitlam was campaigning against Billy McMahon, who makes Mathias Cormann seem charismatic. But in 1969, Whitlam had none of these advantages. 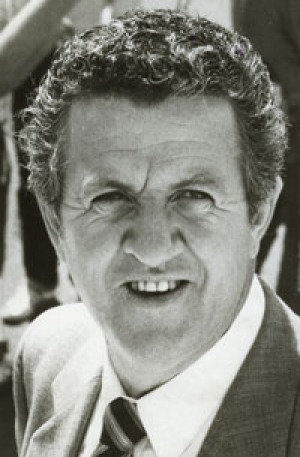 The long serving federal ALP secretary Cyril Wyndham had been hounded out of his job a few months before and Mick Y oung was filling in for him, with a $50,000 budget and a shambolic, federalised campaign structure, beholden to some pretty dreadful state based factional hacks and time servers. Despite this sort of dead weight in the saddle bag Whitlam in 1969 won a huge national swing of 7.2 percent and picked up 17 seats across the country, without losing any. He won 50.2 percent of the preferred vote across the nation and fell three seats short of victory. It was a stunning result in the circumstances for Whitlam and this was a contest in which the World War II air force navigator Whitlam went head to head against a Coalition led by charismatic former air force fighter pilot John Gorton. Both of these men knew what cricketing invincible and former World War II fighter pilot Keith Miller meant when asked by Michael Parkinson about the pressures of facing up to fast bowling in cricket and Miller responded with his famous larrikin quote: “pressure is a Messerschmitt up your arse, playing cricket is not”. The downloadable PDFs below show the original research done by John Black in 1981 for the ALP’s 1983 winning election campaign strategy. Project 2A starts with the methods used and the long run profiles of rusted on voters and volatile voters during the period 1966 to 1975. Projects 2B and 2C cover the Labor’s outstanding 1969 campaign run by Labor’s then charismatic new Leader Gough Whitlam and the much smaller swings from 1969 to 1972, which finally installed Whitlam in power. The Australian Democrats were formed in mid 1977 under the leadership of ex-Liberal Minister Don Chipp. The party was formed primarily to provide a vehicle for the Victorian Senate Campaign of its Leader to a lesser extent to provide a power base in the Senate for the same man. In this context the aim of the part was to win support in roughly equal proportions from both major political groupings by gaining ( Senate ) votes from the “middle ground”. In the lower house the party furthered this strategy by contesting as many seats as possible, winning votes from weakly-aligned pro and anti-labour groups, and then returning this support via a two-sided how to vote card. No one has ever demonstrated to my satisfaction that this sort of electoral tactic in the lower house has had any net impact on the outcome in any House of Representatives seat. In 1980 Labor Leader Bill Hayden won 49.6 percent of the national Two Party Preferred (2PP) vote, but won only 40.8 percent of the seats in the House of Representatives. ALP demographic researcher John Black was then asked by Hayden to find out why this happened and what he could do about it for the 1983 scheduled election. At this time, with the economy in trouble, Labor was confident of winning a majority of the 2PP vote in 1983, but neither Hayden nor the ALP organisation were equally confident of winning a majority of seats. This had already happened to Labor in 1969 when Gough Whitlam won a narrow majority of the 2PP vote but a minority of seats and Whitlam had to wait another three years to win enough votes to deliver his historic 1972 victory with a national campaign brilliantly targeted and sold to working families in the outer suburbs of our major cities. With the ambitious frontbencher Bob Hawke after his job, Bill Hayden knew he did not have the luxury of waiting another three years if he lost in 1983. As events transpired, Hayden did not even have this long and the leadership was snatched from him just before the 1983 election. The marginal seat strategy devised by the ALP during the previous 12 months was however already in place, and Hawke won 60 percent of the seats in the House of Representatives with 53.2 percent of the 2PP vote. Lessons learned are quickly forgotten by Leaders who assume victory came by virtue of their own popularity and in 1984, with a populist and poorly targeted campaign, Hawke won only 55 percent of the seats with 51.8 percent of the 2PP vote. Worse was to come for Labor in 1998, when Hawke supporter Kim Beazley ran the most poorly targeted marginal seat strategy on record and won 45 percent of the seats despite recording a convincing 51 percent of the 2PP vote. Labor supporters had to wait another nine years to secure Government with a clever copy of the 1972 Whitlam campaign. The two papers here are those prepared by John Black and used by the ALP in 1982/3 to select both key seats and key demographic groups for the 1983 election. It is a reasonably practical guide on how to win Government by maximising returns for effort among key groups in selected marginal seats.